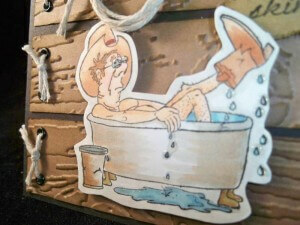 Today’s card was made with another rubbernecker stamp I bought when at convention , Cowboy Ralph sku # 562-03 was a must have and the focal of today’s birthday card for my son ,I thought the sentiment on this card was so funny ” Do these boots make my legs look Skinny ? 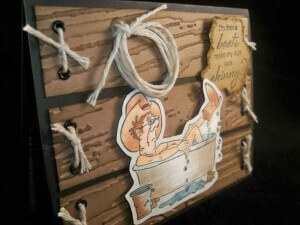 “I tried to keep with a western theme ,in all the old movies they always soaked in a tub in a barn so I decided to make wood panels and added gromlets and rope to add to the rustic look I was going for , this was a simple process for a masculine look card . 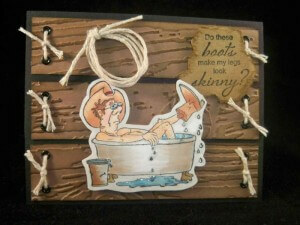 Wow – a great knee slappin card!! 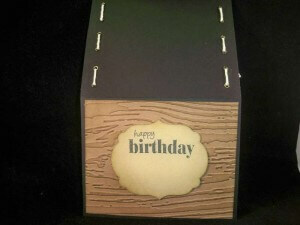 Love all the detail – twine, embossing folder, glossy accents, and eyelts. TFS!